A veterinary researcher at Iowa State University has discovered a novel virus in the central nervous tissues of young pigs with polio-like weakness in their hind legs. Paulo Arruda, an assistant professor of veterinary diagnostic and production animal medicine, led a team of diagnosticians from Iowa State, the University of Minnesota and Kansas State University in an effort to investigate samples from 11-week-old pigs that couldn't walk due to a mysterious weakness in their hind legs. 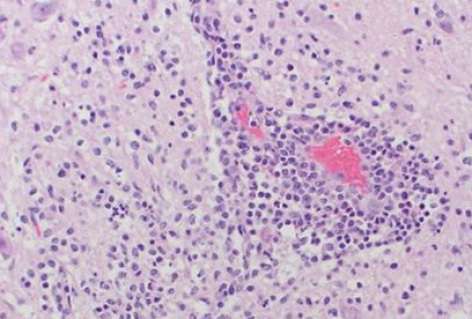 The diagnostic team found microscopic lesions in the pigs' central nervous tissues containing a novel sapelovirus that researchers hadn't previously encountered. Sapeloviruses belong to a family of viruses commonly found in pigs, but this particular strain was different from all other sapeloviruses previously described, Arruda said. "We're collecting evidence, sort of like in a forensic investigation," he said. "But we still have a lot of questions that need to be answered about this virus." For instance, Arruda said despite the evidence collected, the team isn't completely sure the virus is responsible for all the lesions in the spinal tissues or if there's another unknown factor contributing to the neurological symptoms. The pigs originated on a farm near the East Coast, though Arruda said privacy concerns prevented him from identifying the specific operation. Arruda said a lack of scientific evidence regarding the virus means it's impossible to know just how widely it may spread. But the epidemiology of other viruses within its family leads Arruda to believe this particular strain may be fairly common on U.S. hog farms. However, only a small percentage of pigs with the virus likely will display symptoms, he said. The economic impact posed by the virus remains unclear, he said. Farms dealing with the disease may lose 1 or 2 percent of pigs, making it a concern for individual producers, he said. Arruda said there's no evidence the virus makes pork unsafe to eat. The researchers used advanced techniques such as next-generation sequencing to map the entire RNA and DNA genomes of pathogens within the samples. That data allowed the diagnosticians to conclude the virus was novel and present in high numbers within the spinal cord samples of the affected pigs. "This is science-based swine medicine using cutting-edge diagnostic techniques to discover new pathogens," Arruda said.